A well balanced lunch box plays an important role in the quality of your child’s day. Not only does it give them energy and help them focus but it also provides parents with the opportunity to make healthy food choices exciting. When packing a lunch for your kids you have to remember two things- (1) If they don’t like it, they won’t eat it and (2) It’s okay to think outside the lunchbox. In fact, they are more likely to eat what you pack them if you find a way to make the food appealing and fun. For the most part Toodie is no longer a picky eater that fights me on trying new things but sometimes I have to tap into my inner creativity to sneak the fruits & veggies in. Lately I have noticed her lunchbox returns home with a sifted through fruit salad. The watermelon is always missing in action but the other fruits like grapes, blueberries, and pineapple are left behind. Sound familiar? 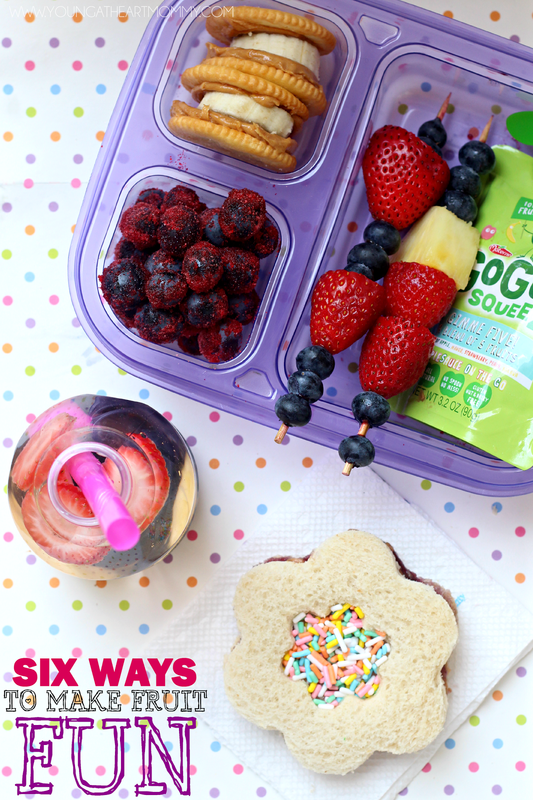 If you face the same challenge with your child then these six ways to make fruit fun and lunchbox friendly may be the solution you need. Sometimes changing your approach can make the biggest difference in how your kiddos view what they are eating. Let’s go from drab to fab and bring a little more excitement to lunchtime! Frosted Grapes: also known as “Sour Patch” grapes, are refrigerated or frozen grapes coated in a layer of powdered jello or drink mix such as Kool-Aid. Wash a bowl of grapes as you normally would and remove excess water before rolling them in the powder. The trick is to immediately coat them after washing so the powder sticks. 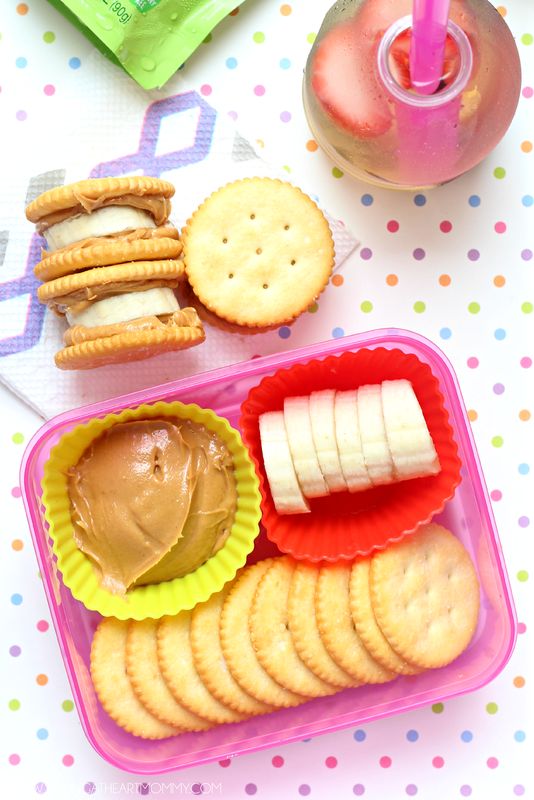 Peanut Butter & Banana Cracker Sandwiches: as if there were anything better than bananas and peanut butter, these mini cracker sandwiches are a mixture of sweet & salty goodness. Feeling adventurous? Add a little jelly or marshmallow fluff in there to take it to the next level. Use silicone baking cups and allow your child to assemble their own combinations. Blueberries & Yogurt Chips: one of my favorite ways to spruce up a bowl of fruit, any kind, is to add a generous sprinkle of yogurt chips or vanilla chocolate chips. Consider it a fresh fruit trail mix of some sort. 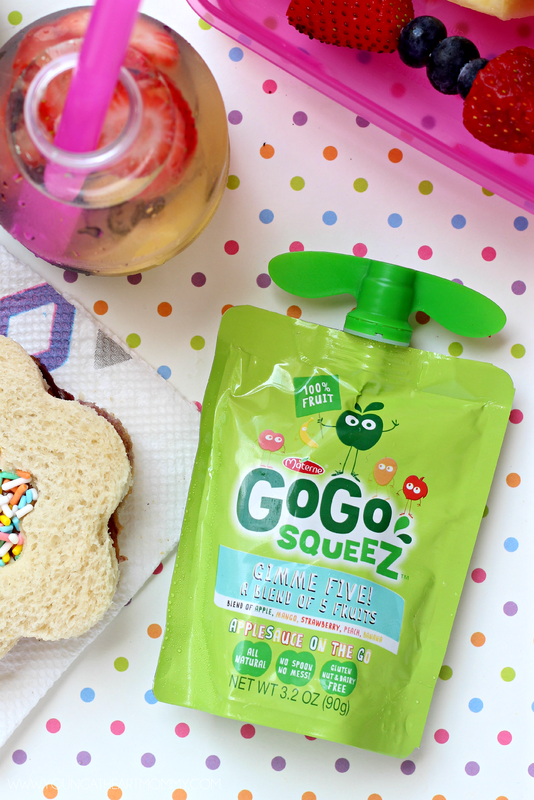 GoGo Squeez Applesauce Pouches: for goodness on the go I include one of these nifty fruit & veggie applesauce pouches. Loaded with yummy combinations and fresh ingredients, your kids taste buds will be doing the tango during lunch time. Fruit Infused Water: in addition to the fruit dilemma, my daughter almost always refuses to drink water on its own. She actually hates it. I found a way to not only get her to drink h2o during the day but also sneak a little fruit in there as well. Use a small bottle and add about 6-7 piece of fresh fruit to infuse the water. Avoid adding sugar and allow the fruit to naturally sweeten it. Pair with a colorful or patterned straw and a boring water bottle has been transformed! Fruit Kabobs: the oldest trick in the book. Putting fruit on a stick just makes it more appetizing. In fact, what isn’t good on stick? There’s a reason that corn dogs, ice cream, and chicken skewers are on them. You can also add a few mini marshmallows on there to make this healthy snack even more fun. 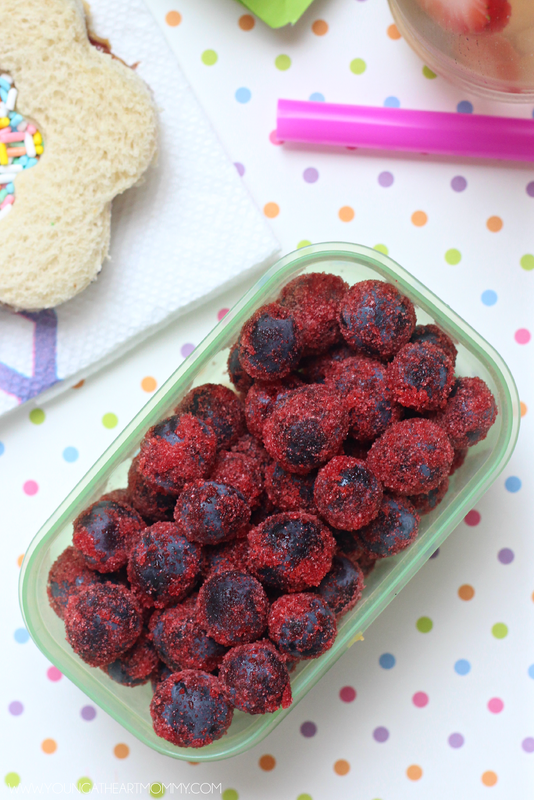 Be sure to add fruits that will not brown and won’t get squishy sitting in their lunchbox. 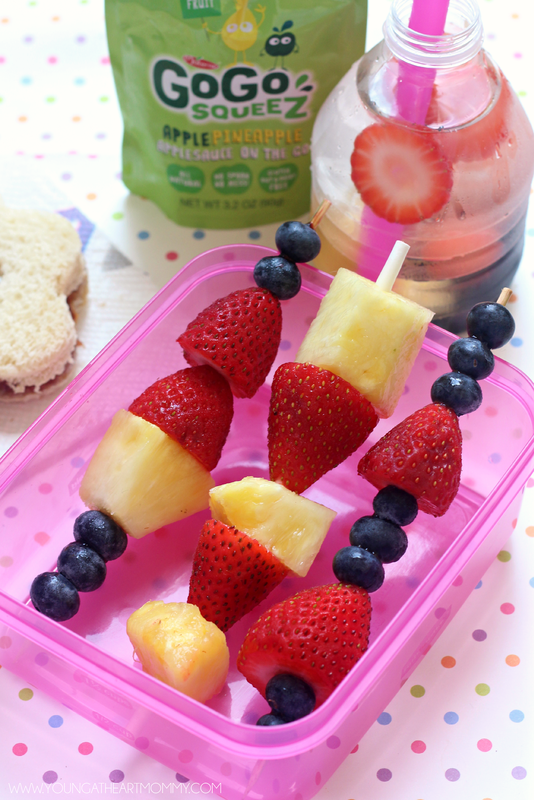 How do you make fruit fun in your kiddo’s lunchbox? Any tips, tricks, or secrets? Share! 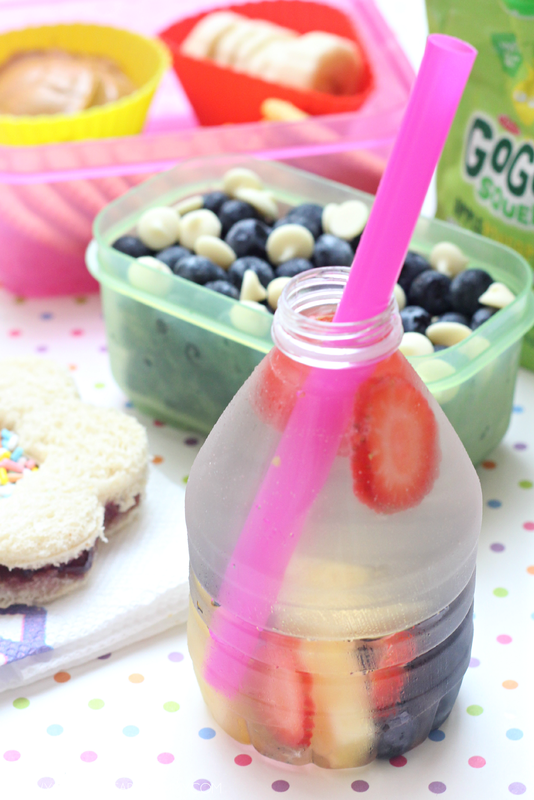 What awesome lunch box recipes to make for the kids! 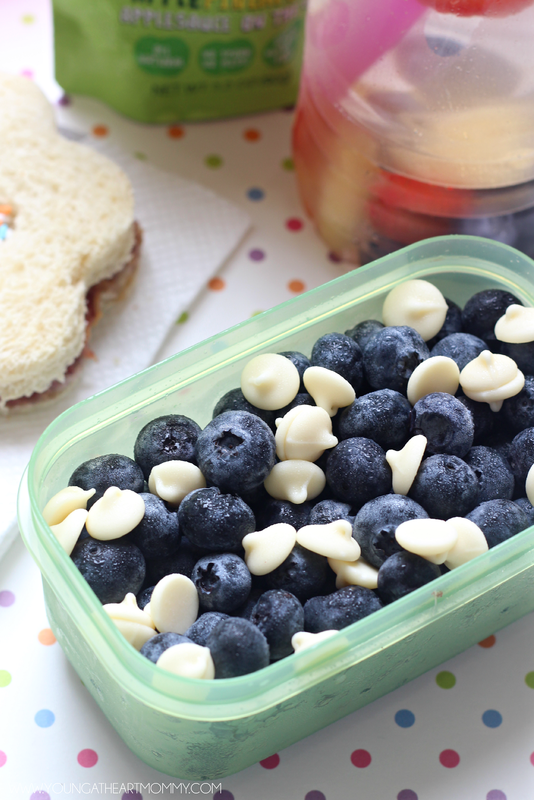 I love the Frosted Grapes and the Blueberries with yogurt chips! Looks so yummy. I will have to try out some of your recipes! The presentation also looks great! SO many wonderful ideas that I haven't thought about. I have always loved doing the fruit kabobs. I also love to take vanilla wafers and put peanut butter and the marshmallow crème in them. They are delicious! These are all great ideas! I love the crackers and peanut butter idea. That's my grandson's favorite snack! I love your ideas here. I will have to try these for my granddaughter. I know that she will love them.